Nearly one month has passed since Malaysian Airlines Flight MH17 was shot down over the skies of eastern Ukraine, taking the lives of 298 people. An international investigation is now underway, led by the Netherlands, with members from Ukraine, Malaysia, the United States, Russia and others. Though the team of investigators examining the crash site have yet to publish their findings and assign culpability to the responsible party, prominent media outlets have obediently toed the line of several Western capitals with reports that all but categorically blame Russia for the aircraft’s demise. Journalistic and analytical speculation cannot be avoided in such a tragic and geopolitically-charged situation. Media outlets have a responsibility to provide both critical commentary and impartial reporting to their readers, but in the case of MH17, the lack of balance is breathtaking. Those parties who unreservedly pointed fingers at Moscow in the hours immediately following the disaster have yet to make public any forensic evidence that definitively implicates Russia with providing anti-Kiev militias with the training or hardware needed to take down a commercial airliner. On the other hand, Russia’s Defense Ministry has made available compelling satellite images and military data that calls the Ukrainian government’s official narrative of events into question. Moscow’s findings have either been laxly underreported or dismissed as propaganda by the West. US officials, such as Secretary of State John Kerry, made numerous media appearances that were used to argue the Obama administration’s position on MH17, that Moscow had directly trained and equipped rebels in eastern Ukraine who carried out the attack. To date, the White House has made available several satellite images that support their version of the story. Moscow responded by pointing out that the images released by Washington carried altered time-stamps that indicate the images were taken in the days after the disaster. Russia’s Defense Ministry also claimed that the weather and lighting conditions in the US satellite images did not correspond to the actual climate conditions at the time they were allegedly recorded. US officials also declined to provide further evidence over concerns that doing so would compromise Washington’s intelligence-gathering capabilities. US intelligence officials who spoke to the Associated Press on condition of anonymity in the days following the tragedy flatly stated they did not possess evidence to substantiate Russia’s involvement; they also conceded that they did not know the identities or even the nationalities of the culprits. There is a clear contradiction between the statements offered by US intelligence officials and the narrative endorsed by the White House. Washington continues to rely heavily on unverified and poorly sourced social media content to validate its claims of Russian involvement. Western media outlets have hardly deviated from Washington’s narrative, while their coverage has strongly assumed Russia’s culpability, despite the wholly circumstantial nature of the evidence disclosed by the West. It is farcical that the country known for overseeing the world’s most sophisticated and far-reaching surveillance capabilities has sunk to citing grainy YouTube videos to justify its policy decisions. An investigative report recently published by Robert Parry, the former Associated Press best known for his coverage of the Iran-Contra scandal, cites American intelligence analysts who suspect that Ukrainian armed forces were behind the attack. Parry’s intelligence sources, speaking on condition of anonymity, claimed that the US intelligence community lacks any satellite imagery supporting the White House’s allegations of Russian involvement, and that the only surface-to-air missile system in that part of Ukraine appeared to be under the control of the Ukrainian military. Neither Washington or Kiev have released images of a Buk missile system being transferred by Russia to rebel-controlled areas of Ukraine, where several high-level Ukrainian officials allege it was fired from before being taken back into Russia. The claims made by Parry’s US intelligence sources have been corroborated by military monitoring data made available by Russia’s Defense Ministry, which detected radiation from Kiev-controlled missile batteries at the time of the MH17 downing. Moscow has made available satellite images that purport to show Ukrainian air defense units deployed in the southeastern parts of the country near rebel-held territory during the time of the crash. Kiev’s concentration of multiple missile batteries in the region is highly suspect because the rebels they are fighting do not possess aircraft. Russia has also claimed that it tracked a Ukrainian Su-25 fighter jet flying in close proximity to the aircraft prior to it disappearing from radar. Parry’s article claims that US intelligence analysts believe that the Ukrainian military missile battery system and the government’s fighter jets may have been operated in collusion to bring down the aircraft. A report published last week in the New Straits Times, Malaysia’s flagship English-language newspaper, cited forensic experts who believed that the blast fragmentation patterns on the aircraft’s fuselage were consistent with that of cannon rounds from an air-to-air assault. 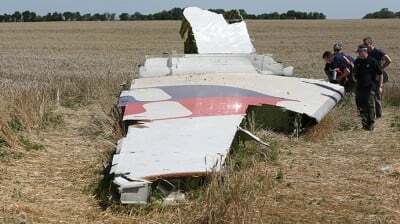 The Malaysian report included testimony from Michael Bociurkiw, a Ukrainian-Canadian monitor from the Organization for Security and Cooperation in Europe (OSCE), who claimed that the fuselage had been pockmarked with machinegun fire. Retired Lufthansa pilot Peter Haisenko was also cited in the report, remarking that a surface-fired missile alone could not have created entry points on both the port and starboard sides of the aircraft. Olga Ivshina, a correspondent with BBC’s Russian language service, interviewed local eyewitnesses who told her that they saw military aircraft in the sky flying beneath MH17 before the incident, only intensifying suspicions of Ukrainian involvement. Ivshina’s video dispatch was hastily removed from BBC’s website, which claimed her report didn’t meet editorial standards. The coverage presented to audiences by Western media outlets has been framed in lockstep with official positions of Western governments, and there is conspicuous and unmistakable effort by these media giants to keep ‘unwanted’ facts and testimony out of the discussion. In light of the evidence brought forward by the Russian side – as well as the questions raised by credible journalists and investigators – the Dutch-led international investigation team should request that Kiev produce raw military radar data and missile battery logs recorded at the time of the disaster. 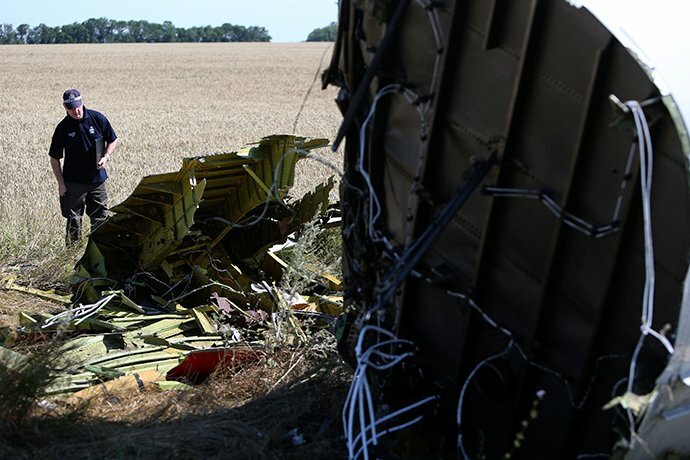 Recordings of Ukrainian air-traffic control’s correspondence with the doomed aircraft should also be made available for public scrutiny. If the international investigation is truly concerned with impartiality, it must objectively scrutinize the evidence on offer and pressure intelligence agencies and governments to substantiate their allegations and disclose the facts.